As of midnight last night the State of Arizona shut down all of its freeway speed cameras. Governor Jan Brewer (R) decided to end the state's two year photo enforcement contract with Redflex which her predecessor, Janet Napolitano (D) signed. 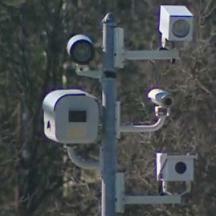 The state will remove a total of 76 fixed and mobile cameras from Arizona state highways by labor day. The move was largely in response to a year long effort by the group CameraFraud.com whose slogan 'The Cameras Are Coming Down" is finally coming to pass. Additionally, the program began to lose profitability when many drivers learned that Arizona law required in person service of citations and refused to pay. Governor Napolitano (now serving as Secretary of Homeland Security) had previously predicted the cameras would bring in $90million in revenue, but in fact over half of the citations issued remain uncollected and unenforceable. Several municipal programs still continue to operate in Arizona, and CameraFRAUD has pledged to bring the cameras down in those cities one by one, bypassing the legislature with local referendums.